The Memoria Indígena gathering, Who writes history? : Indigenous spirituality and identity of missions, took place in Lima, Peru, September 11-13, 2015. Thirty people gathered together from 11 countries, representing 12 indigenous ethnic groups, besides other people from non-indigenous cultures, to listen to one another, learn and share. We especially want to thank those who made a special effort to help make this event happen: Peace and Hope International, SIL Peru, the Evangelical Center for Andean-Amazonian Missiology (CEMAA), and the Latin American Theological Fellowship (FTL), as well as many individual donors from North American churches. We give thanks also to all the participants who spoke and shared their lives, thoughts and passions. We spent three days together focusing on three important themes for the indigenous church: Identity, History, and Mission, with an overarching focus on the idea that the indigenous churches of Latin America must share their stories in order to enrich their own identities, shape their relationships with non-indigenous churches and their mission, and enrich the global church. God has always been present among all peoples and manifested God’s divine self through our cultures and traditions since before the arrival of the missionaries that brought us the gospel of Jesus. When we understand this, it must change the ways and means we use to approach our peoples with the Bible and the gospel. We need a contextualized hermeneutic and a Christian education that incorporates our own stories and cultures and we must continue working for a church that recognizes the importance of the language, organization and ways of thinking of each indigenous people group. Each culture is an important part of God’s creation and therefore each is a carrier of dignifying truths and principles. However, as Christians we affirm that important moral values do exist and that the gospel, as well as redeem and affirm our cultures, transforms our cultures when we seek to live out the values of the Kingdom of God. The gospel close to our hearts allows us to scrutinize and judge what is good and retain it, without hurting our ethnic identity. In this manner, with the help of the Holy Spirit we can know what aspect of the culture dignifies our neighbor, the indigenous person and, above all, God. It is therefore necessary that the church recognize that the local community has an important role and has the right to affirm its own culture in light of the gospel. We desire to seek the face of God in our cultures and mythical histories which serve as our old testament, revealing how God has been made manifest in our sociocultural and historical context. The recovery and preservation of our cultures is of utmost importance, but we also recognize that culture is dynamic and is constantly adapting. Therefore, we reject the nativist assertion of certain people or groups that say we must preserve or recover a supposedly essential form of our cultures that does not respect those indigenous people and communities that practice a religion like Christianity. As indigenous Christians we reaffirm our cultural identity and we also recognize that we must analyze and criticize any pattern of our culture that discriminates, subjugates o excludes. To fulfill the mission of the church within our context is the work of all Christians and we trust that the Holy Spirit can guide us in this path. And while only the local community has the right to criticize their own culture in light of the gospel, we recognize that we need the support of the entire body of Christ, including the non-indigenous churches, in this task. All the members of Christ’s body are interdependent and we all have the responsibility to communicate Jesus’ message as a message of peace, coexistence, hope and love. We must seek appropriate missions methods so that the root of the gospel grows deep into our cultures. We need a contextual pedagogy that incorporates our narratives and stories with the story of the God of the Bible in order to effectively communicate the message of Jesus from one generation to the next. The project of evangelization among indigenous peoples must be from the indigenous context and with the indigenous person so that the gospel does not become a list of rules or a burden imposed from outside. In our missional labor and act of communicating the gospel of Jesus can generate conflict with some traditional beliefs and practices of our peoples. We must recognize that the more conservative sectors of each ethnic group have had a negative view of indigenous Christians. Because of this it is pertinent that we should work to serve them, demonstrating that before we were Christians God made us indigenous people and we continue to be an integral part of our communities without having to commit ourselves to practices that infringe on our Christian values and principles. We learn by watching and imitating others’ practices. So it is necessary that we come alongside Christian men and women in their formation in order to cultivate exemplary Christians who our peoples can imitate in their daily lives. Consequently it is important that we empower indigenous believers and evangelists, and especially give them the space and voice to criticize foreign missions that have not been able to balance culture and the Bible, that is, the word of the people and the word of God. 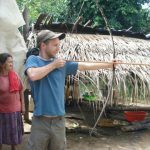 When we think of our mission, we need to rethink our relationship with the rest of the body of Christ, both with the foreign missionaries and the non-indigenous churches that serve indigenous peoples and churches. We believe it is important that the church permanently continues to be reformed and takes on an intercultural perspective as part of the life of unity of the body of Christ with respect to the diverse cultures that surround us. Thus in regard to the foreign missionaries we must avoid allowing them to take control of defining what is good and bad in our context. We also see that even today the urban, Westernized churches in our countries continue to reproduce stereotyped and often negative conceptions of indigenous peoples. Many publications about indigenous peoples never consult whether the indigenous people agree with their assessment. Therefore we need to undertake an intercultural dialogue in the church so that we all can see that God also speaks out of language of cosmogony, out of our everyday lives, as well as through the Holy Spirit. Non-indigenous churches and missionaries must understand that in order to achieve a lasting work together with indigenous churches we must embark on a long process with the local community because discipleship must be done in our own language and from our own culture and because, just as we have learned from them, they have much to learn from us. Within evangelical missionary practice we have to listen to the voice of the evangelized, our indigenous brothers and sisters. Until now, the world only knows something of the story of our peoples and churches from the perspective of the foreign missionary, but we believe that it is very important that the story is also told from the indigenous perspective. In the same way that we learn about God and the works of God through the people of Israel in the Old Testament, in our churches we should learn about where we come from, who have been important people in our story, and how God has worked through our own members. We must raise awareness that the libraries really live in our communities. Many times we seek to life and our communities through a library or an institution, written and controlled by outsiders. It is our responsibility to begin to motivate the new generation to listen to the stories of their elders as a primary source of information. So we need to encourage the new generations to know our stories, employing strategies to dialogue with our elders, because without understanding our past and without teaching our story to our children, we will not be able to understand our present nor will they be able to shape our future. We must also tell our stories for the good of the global church, especially for the sake of the church in Western society and for the reconciliation of non-indigenous and indigenous churches. There exists a need for a literate indigenous community to write our stories from our narratives, and at the same time there must be action to stimulate and motivate orality since it is the most dynamic and sure way to transmit indigenous knowledge and principles to the following generations. Recognizing the importance of telling our stories, we have decided to embark on a project to write, record, compile and publish all the stories which speak to the birth and life of indigenous/autochthonous/native evangelical churches in Latin America as well as their theological production. We will focus on biographies of individuals, stories of communities of faith and historic events which have played a key role in the history of our churches. We also desire to look beyond the walls of the church and remember the stories of leaders among our peoples who have struggled, and sometimes died, to protect the permanence of our peoples on our lands, without whose work neither our peoples nor or churches would exist. Through the process of telling our stories we also hope to recover and give value to our cultural practices which promote life and the values of the Kingdom of God. Memoria Indígena is a non-profit organization that seeks to walk alongside and support indigenous churches, record the stories of God’s work among indigenous peoples throughout history in Latin America, serve as a bridge between indigenous churches and those who accompany and serve them, and bolster the diverse identity of the body of Christ by facilitating understanding between indigenous and non-indigenous Christians. See http://www.memoriaindigena.org/.